At the time I finished my biography of the polymath Alasdair Gray, in 2008, my subject was at a curious juncture. Though an artist for six decades, he remained a footnote in his country’s art world. Though the author of the most celebrated Scottish novel in the last hundred years, Lanark, and several others which altered the literary landscape of his home city, Glasgow, beyond recognition (Poor Things, 1982, Janine, Unlikely Stories, Mostly) he was dependent on a small Royal Literary Fund grant and regular scraps from various overdue projects for his living. (Gray is, was, and always will be a Republican. He once turned down a knighthood.) 2007 saw the publication of what he called “my final novel,” labeled as such because he’d quite simply run out of old unpublished manuscripts to pilfer ideas from. The spares drawer was now empty. Meanwhile, no matter how many times he reminded folks that he had stolen it from the Canadian poet Dennis Lee, he was still always credited with the only quote outside the still-new Scottish Parliament building: Work as if you live in the early days of a better nation. In his old age, there was talk of him becoming that most disgraceful of things—an uncontroversial “national treasure,” awaiting death, then platitudes from the great and the good, and then probably—the horror!—a statue. All this was an ominous sign for an artist who had always defined himself in opposition to political power. Ever eccentric, always quotable but increasingly inconsistent in output, Gray appeared to be reaching a stage where, after the decades of plays, polemics, murals, portraits, novels, short stories and books of poetry stretching back to the 1950s, he was becoming irrelevant, overtaken by his times, as happens to most artists eventually. His only remaining ambition appeared to be to collate all his works into neatly labeled (but misleading) titles. In the final interview for my book, I asked: so what did he have left that he wanted to do? His answer, put simply: wrapping things up. A book of his collected verse, one of plays, one of stories, one auto-pictography, one of political works, and a collection of his non-fiction works. All these were in the planning stages in 2008. This imposing list was in fact an imagined bookshelf he had dreamed of completing as an asthmatic, eczema-ridden teenager, idly sketching in his notebooks, dreaming of success. Now, sixty-five years later, all the books in that list finally exist. Publishing them all in such a short space of time seems like an act of retirement. Have they been vanity projects? A recent documentary on BBC Scotland, broadcast to celebrate Gray's eightieth birthday, illustrated the challenge for anyone wishing to tackle the man and his work. * He's simply so busy, even now, on multiple projects, that it's hard to make any sense of the whole by focusing on any one single piece, or even a collection of pieces, which might speak to each other. This is further complicated by the fact that many new works are in fact recycled versions of previous ones. Skulls with winged babies inside, dogs with bones, any and all images familiar from previous projects now resurface in new contexts, reborn. Old murals, since destroyed, are remade on new walls. The eightieth birthday program, A Life in Progress, focused mostly on Gray’s art, whose reputation has, after a lag of sixty years, suddenly caught up with his literary reputation thanks to the work of his agent Sorcha Dallas and her birthing of the Alasdair Gray Foundation. At the time of filming, Gray was finishing a mural in a Glasgow subway station. He was also still pursuing what is now routinely referred to as “Scotland’s Sistine Chapel”: his great Oran Mor ceiling, depicting Adam and Eve in a Garden of Eden resembling both a night sky and contemporary Glasgow. In this program, Gray the democratizer was on show. There was, however, little mention of his controversial role in the campaign for Scottish independence, the “settlers and colonists” debate which saw him accused of being an anti-English racist,** and none at all of the recent literary glut—Collected Verse, A Life in Pictures, A Gray Play Book, Independence: An Argument for Home Rule, Every Short Story 1951–2012 (which included an entirely new story collection), or indeed the publication under the microscope here, Of Me and Others—the collection of his life’s non-fiction that he’s been promising, on and off, since the 1990s. All of which is understandable. Or else the documentary might have lasted until his ninetieth birthday. The sheer weight of Gray’s output in the last decade or so is enough to challenge the attention (and the wallet) of his most ardent supporters. How do you keep up? He switches publishers for almost every publication. He supports the small and the local ones where he can, meaning some of his books go virtually unnoticed. *** (The Collected Verse sank without trace, except for a single lukewarm review.) What else? Gray controls every aspect of each of his projects, the textual and the visual, right down the margins and even the typeface, one of which he has invented himself. It’s overwhelming, sometimes confusing, and—if you pick the wrong book—it can be disappointing. With a writer of this kind, where on earth does someone new to the oeuvre even start? Oddly enough, this retrospective collection of bits and literary bobs is the perfect place. The author suggests it might have been titled A Life in Prose. That would have been appropriate. The range of the pieces contained here is startling. As ever with Gray, there is little point trying to distinguish the different forms on display from each other, as they bleed into one—Of Me & Others starts and ends with a poem, and between these two lie speculative essays which give way to fiction, school and university assignments, epilogues, obituaries of close friends, unpublished rants, book reviews, a proposed constitution for a future independent Scotland, extracts from his novels (the “factual bits,” so he claims), and much more besides. It’s tempting to judge a collection like this on its inconsistency—and it’s certainly inconsistent. But it’s also a rare insight into a rare intellect, as well as being worthwhile purely for drawing attention to old writing which is as essential now as it was in 1986, or ’79, or ’57. What’s most remarkable is the tone throughout. With the exception of the teenage pieces, which show a little more flourish and a little less control, Gray seemed to arrive complete as a writer. Like his artistic style, and indeed his politics (old-fashioned Socialist) it formed fast and set for good as if in stone, untouched by the passage of time or intrusion of new events. Asterisks peppering the text show how Gray has often found himself saying the same things repeatedly over the years, sometimes decades apart. Why write a good new sentence, he suggests, if you already composed a great one? And so the asterisked sections in Of Me & Others, many of them, each marking out a place where the author returned to his favorite topics: Riddrie public library circa 1945 (good), Socialism (doubleplusgood), the modern British Labour Party (bad), 1707’s Act of Union between Scotland and England (unfinished business). The asterisks appear to be designed to save readers regular déjà vu. It’s not unusual for a great writer or artist to identify closely with those they grew up with, dreamed of success with, got drunk with, and planned futures with—and Gray is no exception. In Gray’s case, he has two groups he identifies with, literary artists and visual artists, and it’s striking just how much of his energy he has given over the years to supporting the work of those others around him who he believes have been unfairly overlooked. The pieces contained here which detail his own ignored generation are almost always driven by that powerful motivator, guilt—guilt that out of all his friends, he was the one whose name looms largest in his nation’s culture, and the one whose work has travelled farthest. Close friends John Connelly, Joan Ure, Elspeth King, Archie Hind, Bill Skinner and others all have dedicated pieces here. You don’t need to know who those people are to enjoy their life stories. Here are the ignored, the downtrodden, the unlucky, the talented, people who succeeded in life despite it all—at least, that’s how Gray sees it. And he always colors the life with history, cultural context, as well as unashamed political bias. Occasionally the pieces come over as grumpy, even paranoid. It’s never considered that perhaps some Glasgow artists have been overlooked because their work didn’t merit any more attention. But then, that’s hardly the point. For fans, there’s plenty in Of Me & Others in the way of the trademark playful marginalia to keep those who know Gray’s work entertained. There’s also evidence of just how unable to leave old work alone the crafty auld bugger really is. In the Foreword, he admits: “I have improved a few sentences so that my younger self seems to write better than he did.” In other words, he’s still editing his schoolwork. Which reminds me of when I was working as Gray’s secretary, typing up his first play for what became A Gray Play Book. (Only performed once, with puppets, in a school classroom in 1949.) Laughing the whole time, unable to resist his own cheekiness, he couldn’t help but go back and correct his fourteen-year-old self’s prose where his seventy-something mind felt it could be improved. “Aha!” he’d cry out. “I’ve finally got that line right!” So several pieces here have been tweaked, rewritten, expanded and changed to suit the artist as he sees the world now. But that sort of minor silliness, fully in evidence throughout, shouldn’t be allowed to overshadow the work itself. In fact, Of Me & Others contains some of Gray’s finest works, and gathers together pieces which were previously unavailable or, as I unfortunately know simply all too well, very hard to get hold of. The effect of reading these assorted non-fictions together as one is startling. Gray’s introductions to his own books are usually slippery at best, or at worst downright misleading, but they are always illuminating—not only about the book in question itself, but also about the context in which it was written. The process, the reception, also the hopes he had for each project, most of which he ended up unhappy with because he had, as usual, missed deadlines, or been unable to achieve what he set out to. Occasionally, he is even honest: “I thought this book would turn out to be a ragbag of interesting scraps,” he writes in the Foreword to Of Me & Others. “I now think it has the unity of a struggle for a confident culture, a struggle shared with a few who became good friends and thousands I have never met.” On the evidence of what follows, that’s true. The nature of this kind of book is that it does not have to be read as a whole, or chronologically—it certainly isn’t laid out chronologically. And there are pieces here that many readers, even the most avid fans, may not be interested in. Amongst his finest essays—an unforgiving Middle Age Self Portrait (1987) and an illuminating history of his Hillhead Subway Station mural (a collaboration with his most essential helper, Nicol Wheatley) there are several others which suggest Gray has put the book together with more concern for completism than for quality control. This was a feature of the other “collected” books as well. Every Short Story is not quite exactly what it says in the title, but perhaps its nine-hundred-plus pages might have been a special Selected Stories of a mere four hundred or so. There are also pieces readers could not possibly understand or enjoy unless using Of Me and Others as a reference book alongside Gray’s other books. The introductions to, and Afterwards from, many of Gray’s fictions are perhaps aimed at future readers, future critics, no doubt in a future independent Scotland. Though essentially a humble man, keen to please with “the over-eager manner of one who fears to be disliked”, Gray is also arrogant enough to believe that historians of the Twenty-Second Century will want all this detail, those in Scotland at least. (He’s aware of only being a cult concern outside Scotland, and virtually ignored in England.) No matter whether it makes for smooth reading now, the Contents list cries out. What’s now when there’s forever to think about? Why should I walk with many others through the centre of Glasgow complaining about a government that lets me vote to keep or change it every five years? I am not driven by esprit de corps, team spirit, don’t enjoy feeling part of a crowd. I think most goodness, truth and beauty has been achieved by folk like Jesus, Galileo and Van Gogh who were out of step with multitudes. Soldiers marching together appal me as much as a line of high-kicking chorus girls appal most feminists. I only take part in political demonstrations when feeling it wicked to stay away: a state experienced in 1956. He then goes on to contextualize that series of marches across the UK, U.S., Australia, and elsewhere, who voiced their objections to the Iraq war in 2003, but were ignored, by way of the Suez crisis, Margaret Thatcher and Muriel Spark’s classic novella The Prime of Miss Jean Brodie. But this is where Gray’s strength lies. Where others photograph the landscape, he paints it carefully, layer by layer, making sense of the here and now through the long lens of history. That same piece finishes: “What that Jewish extremist, Jesus, preached from a small hill near Jerusalem, was not idiotic.” And Gray’s no fool either. Of Me and Others is proof of it. Rodge Glass is a Scotland-born writer whose books include the short-story collection LoveSexTravelMusik, the novels No Fireworks, Hope for Newborns, and Bring Me the Head of Ryan Giggs, and the Somerset Maugham Award-winning Alasdair Gray: A Secretary's Biography. * Readers with some knowledge of the make-up of Britain may notice this programme was shown on BBC Scotland, not UK-wide. This is true of nearly all documentaries about Gray. He is celebrated enough in Scotland to have an hour-long documentary on television simply on the occasion of his eightieth birthday (and also seventieth, too), but so little known in England that showing the programme UK-wide might be seen as bizarre. ** This refers to the essay “Settlers and Colonists,” published in Unstated: Writers on Scottish Independence (Word Power Books, 2013, edited by Scott Hames) in which Gray argued that not enough Scots were employed in top Scottish Arts jobs, most of these posts being dominated by English who, he argued, were not invested in the culture and saw their jobs as a step on the way to bigger jobs back on the other side of the border. It was a huge controversy, which saw Gray widely attacked, personally ridiculed and singled out as a “racist” in the fiery debate pre-referendum. *** Collected Verse, for example, was published by Two Ravens Press, a tiny independent based on the Isle of Uig; Every Short Story and A Life in Pictures by Canongate of Edinburgh; A Gray Play Book by Luath, another small indie. 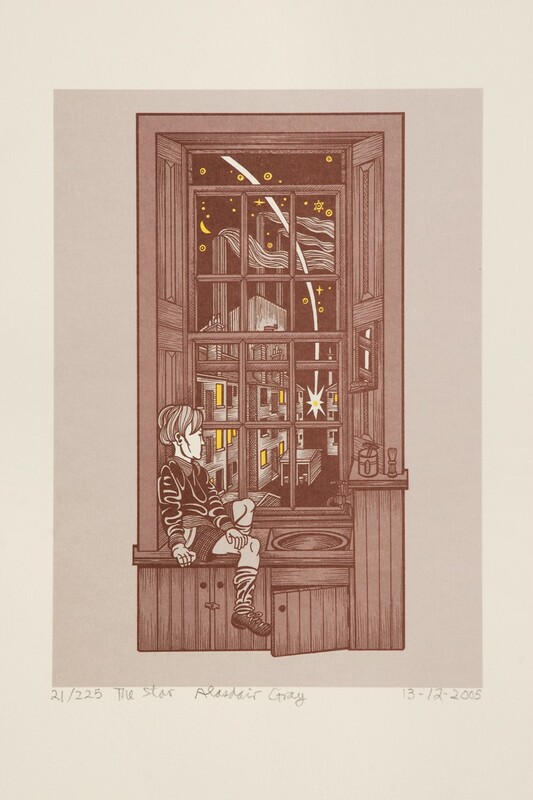 Banner image: Alasdair Gray, Oran Mor (2004). Mural, dimensions variable. Courtesy Sorcha Dallas Gray.